Good People Surf welcomes you to our Surf Camp and School in the Beautiful Basque Beach town of Zarautz. With our Surf Camps and School we like to bring people together in a fun way to have an unforgettable experience. Our main goal is to teach you all about Surf and Ocean awareness, as well as showing you the insights on the Beautiful Basque Country-side and culture. The town of Zarautz with its beautiful surroundings where the ocean and mountains meet at just a few steps away. Also known for its gastronomy with the famous ‘Pintxo’s’ and cosey ‘plaza’s’ for a great social get together. Michelin star city San Sebastian is just around the corner and so are several natural reserve parks in the area for some mountain action. Good People Surf offers you a variety of instruction, equipment and accommodations, always focusing on what is best for you to have fun, be safe and to learn. Each location is unique in culture, climate, and waves. Whether you join us in Spain, Portugal or Morocco, you will have the same high level service and experience that began in Zarautz more than 17 years ago in 2000. Learn to surf and improve your moves at the Surf Camp Zarautz. We welcome beginning to advanced surfers to join us for an amazing experience on our family feel camp. 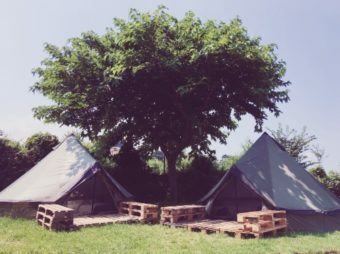 Set up in a green surroundings with different accommodation options to choose from. Wether you travel alone or in a group, are a vegetarian or meat lover, slashing waves or still catching white water, you will find yourself right at home from day one. If you are looking for good instruction while having a great time, the Good People Surf School offers all levels of classes and lessons for learning to surf and for reaching the next level. With years of experience teaching in the waters and beaches of the Basque coast we are equipped to meet the needs of nearly all types of surfers from beginners to advanced, to those surfing longboard or shortboard. Equipment rental is available to make sure you have the right board and wetsuit for any conditions. If you want to learn how to surf with a group of friends, as a business or school activity, we can offer you a customized camp with accommodation, food and activities. 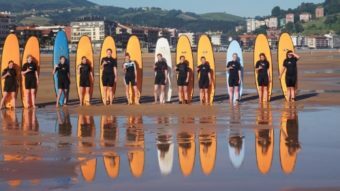 Good People is a pioneer in Surf Camps in Zarautz and we can accommodate groups up to 100 persons. With 17 years of operations on the Basque Coast, we bring the highest level of experience, enthusiasm and personalized service to a surf camp experience rooted in the coastal lifestyle. For a great outdoor camping experience, we offer basic style caravans in a romantic atmosphere. 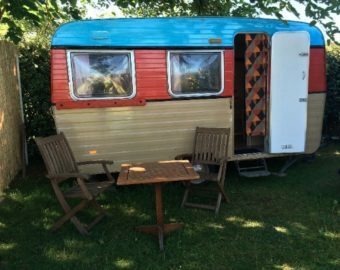 The caravans come with a double bed, closet space and a small table with 2 chairs and electricity. The location is Gran Camping Zarautz, a beautiful campsite with great sanitary, amazing views and a good bar/restaurant with outside terrace and a typical Basque Cider restaurant with great food. 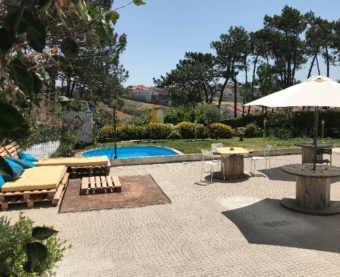 Close to Lisbon between the world surf reserve spots Ericeira and Peniche, lays the picturesque village of Santa Cruz in the fantastic countryside of Torres Vedras. The town is surrounded with several great un-crowded surf spots, even during summer. A great place for your first surf experience or catching some good waves with friends!